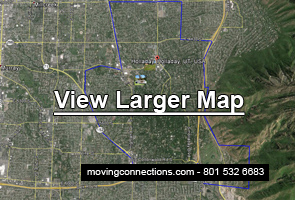 Moving Connections is your local Holladay mover with the best moving teams in the business. That’s why we’re a front runner for local moving services along the entire Wasatch Front. If you’re looking for an affordable yet professional mover, then Moving Connections is the company you should call. With a full complement of supporting services, such as home staging and climate controlled storage, and with the fact that Moving Connections is federally licensed, bonded, and insured, you know that we are professionals in business for real. We’re also sensitive to the prevailing economic conditions and the needs that some Utah families and individuals have to stretch their budgets. That’s why Moving Connections is a Moving Company offering a service for residential moves that can save you considerable money. It’s called a “Labor Only Move”. So give us a call, or click on one of the buttons below for the type of move that interests you to find out more about our service. If Moving Connections is moving you to Holladay it's a perfect time to begin to utilize the many resources and bounties of Holladay. For example click on the picture to the left to go the Moving Connections 'Support - Advice - Assistance' page and discover Holladay for the first time. Once you are on the 'Support - Advice - Assistance' page go ahead and open the .pdf link found there and tape the list of emergency and useful phone numbers on your refrigerator. Moving Connections has gone to great pains to find those links and connections to integrate you quickly into Holladay life. Probably Moving Connections’ most popular option is our full service residential move. With this service, we pack, load, transport, and unload all of your household goods. Maybe it’s the convenience, or maybe it’s the security that comes from knowing that your valued items are being handled by experienced professionals in the field that makes this service so popular. Whatever it is that makes this service so appealing, Moving Connections will do everything in its power to make your move a seamless transition to your new location. So give us a call now, as slots fill up very quickly. We’ll be happy to give you a quick quote for the cost of your move, or to discuss matters such as storage space, or staging your home for a quicker and more profitable sale, or crating extremely fragile goods, etc. Moving Connections stands ready to assist you in all your moving needs. A Labor Only Move differs from a full service residential move in that you, the customer, provide your own truck and driver, while Moving Connections just provides the labor and loading expertise. Instead of pulling up to your home in a 26 foot moving truck outfitted with blankets, dollies, and other equipment, our crew just shows up in a small pickup truck with a few helpful items and maybe some stretch wrap. Our Moving Connections Holladay moving crew will professionally pack and wrap your household goods, and then load them on “your” (probably a rental) truck according to professional standards. Then you drive away. So you just pay for a few hours of labor, but not for driving your goods to their new home, and not for unloading them at their destination. So you’re really ahead of the game, especially if your new home is rather far away, because you’ll save a lot of money. If you still have questions about how the Moving Connections Labor Only move works, or you would like to book a move with us, or if you just have some general questions about your Holladay move, please give us a call or you can email us if you prefer. We’ll be happy to answer your questions and to give you quick quotes that show the difference between the full service move price and the labor only price. There’s no obligation, so call now. You can check every one of those criteria for Moving Connections, and many more. Moving Connections is experienced at moving businesses and will coordinate with you to keep your business up and running while we move it. We also do not have junk fees and other spurious charges to inflate our wallets. You get charged for our crews driving and labor time, plus boxes and tape. There are no piano board fees, or furniture dolly fees, or fuel surcharges, or taxes of any kind. We field the best crews in the state, because we hire only experienced professionals. Moving Connections is federally licensed, bonded, and insured. We have been serving the Wasatch Front and Utah for more than thirty years. So give us a call to learn more or to get a quick quote (no obligation, no cost) or to ask any questions about your Holladay move.